Usage Capping allows core facilities to define how many hours a user may schedule on a particular piece of equipment or at a service center at any given time, and to place restrictions on reservations that exceed this defined amount of time. If a user makes a reservation that exceeds their allotted amount of time, the service center administrator will need to approve that reservation. Alternatively, the service center administrator can deny any reservations that exceed this usage allowance. NOTE: Usage Capping can only be turned on by iLab associates. If you would like to turn on usage capping at your core, please contact iLab Support. Once a reservation has been scheduled, the amount of time that has been booked for that event is deducted from the user’s allotted usage. 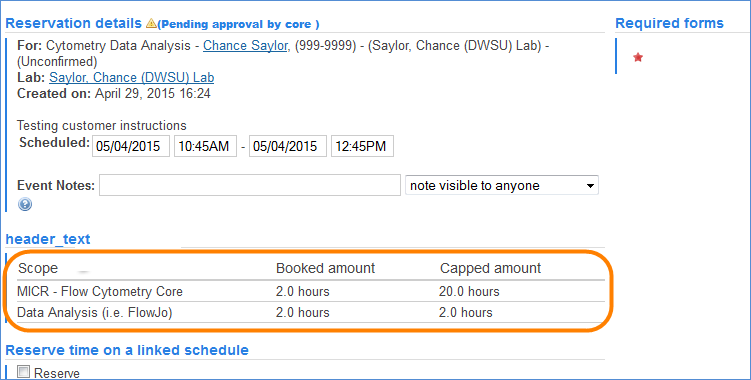 Reservations that are marked as Pending Approval are also deducted from the user’s time allotment. Once a reservation has begun, the total amount of time reserved for that event goes back into the user’s time allowance for further scheduling. Usage capping can be defined at either the Service Center level (where usage of all the service center’s equipment contributes to a service center-level total), or at an individual Resource/Equipment level. To configure usage capping rules, navigate to the Schedule Equipment tab of the equipment core. Select the "More" button to open the drop-down menu and choose "Manage Usage Capping" (as shown below). Select "Add capping" to add a new capping rule. 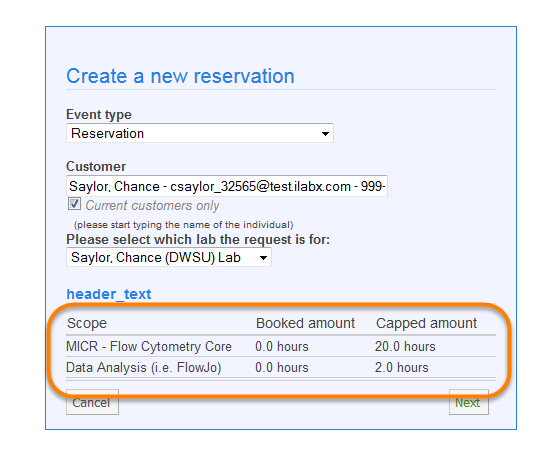 Select Capping Scope: Choose whether the usage cap will be applied towards usage at the Service Center level or at the Resource (i.e. equipment) level. Limit Usage to: The number of hours of usage that are allowed for reservations before the cap is applied. Reservations made for a point in time after this event horizon WILL be subject to capping rules. Reservations made for a point in time before this event horizon WILL NOT be subject to capping rules and will not contribute to hourly usage calculations. Core administrators will still have the ability to override reservations that exceed the allotted time if they are placing reservations on behalf of a customer or if they need to reserve time on an instrument for internal reasons. Core maintenance events are not subject to usage capping rules. To edit existing usage capping rules, click on the "Edit" button beside the scope you would like to edit. The "Edit Usage Capping" screen will display. From here, follow the instructions outlined above to update your rule. Note that you may also remove a rule by clicking on the red "Remove" button. When you are on your core's Schedule Equipment page, the "View my usage statistics" button will display for your customers if you have usage capping defined at the service center level. Click the "View my usage statistics" button. Usage numbers for your core will display. When you are in a resource calendar, the "View my usage statistics" button will display if usage capping has been defined for that resource. Click the "View my usage statistics" button. Usage numbers for that specific resource will display. When a customer makes a reservation on a resource that has usage capping rules defined, they may view capping details on the reservation details page when they make or view a reservation.